Facebook Marketplace app is now made available within the general Facebook app on iOS. It is located at the bottom of the Facebook app on iOS or at the top of the app on Android. The Marketplace on the left side when Facebook is opened on a desktop. unlike most Facebook products, the FB Marketplace is not a standalone app but included in the Facebook Messenger. The social media giant has opted not to create a separate app. 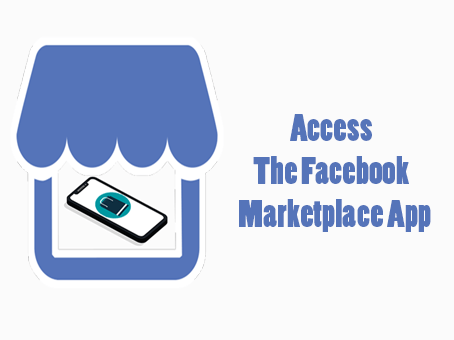 To get facebook Marketplace access on iPhone or iPad you simply download a recent version of Facebook on the App Store. After installing the facebook app on your iOS device, tap to open it and check the menu bar at the footer area of the screen. There is an update of a show-window icon. Tap to open the facebook marketplace app section to start buying /selling platform opens up. The Facebook Marketplace consists of a search bar, four action buttons (Sell, Categories, Search, Your Items), and an available items area. The Search feature helps users filter out products on the Marketplace app that matches inputted search keywords. It also allows users to search based on Category, or you can as well swipe to unveiling more and more product offers. Facebook marketplace sends a notification whenever an offer is made, a product is sold or a seller replies. To sell go to buy/sell platform on the home screen and tap the Sell button. Tap to Add a photo from the camera roll or snap it immediately. Provide a name, description and set the price tag. Post the product by tapping on the post button. Locate a product you want to purchase. View the Seller Information including seller standing. Make sure you read all the details the item you wish to buy and you can also use the Message Seller to get more info. Tap to Make Offer this will notify the seller of your bargain price for the product. Continue negotiations until the deal is closed. Tip: Make sure to double-check pickup options to avoid additional costs and inconveniences! Facebook as a company does not influence dealing but liaise between buyer and seller. Furthermore, there is no negotiation, commission for deals on the Facebook marketplace app.